Nail art, there are now in a huge bandwidth available in retail stores. The most popular are probably still the rhinestones and the stickers. The rhinestones can be used at will either in the gel and thus be processed without a break in the modeling, or they may be stuck as a conclusion to the high gloss finishing on the modeling. More effect achieved the latter variant. The best are probably the rhinestones by Swarovski, as they are ground very well and thus achieve a very nice effect. The rhinestones are available in many different colors, Shapes and sizes. Micro beads and pearls are also popular, especially for bridal nails. They give the design a very sophisticated touch. Nailartsticker come in various colors, Designs and materials. Moulded in rhinestones or glitter to give the stickers a noble touch, One-Stroke 3-D stickers or sticker often look, as if the subject has been hand-painted on the nail. Commercially, you can also buy film, where you can print their own tattoos. Who does not want to work with stickers, can resort to the stamping. All you need is a Stampingschablone, a stamp, a card for pulling off the mask and a suitable coating. As with a real stamp, first, the paint is applied to the Stampingschablone, withdrawn with the card, with the added punch and then applied to the nail. Again, there are many different designs and one is with the different colors of paints a much more flexible, than with the stickers. Shell fragments and Morosplitter are another, very nice way, the nails to make. They are placed before placing into the gel and we can achieve great effects with them. A similar effect depositors, so-called shape. They come in many shapes and colors and they can usually handle simple. Piercings have now taken it to the nails. Here is a small hole drilled at the tip of the nail and pushed through a piercing ring, alternatively there are various trailers, you can put on the ring. Glitter is currently probably the most popular variant of the French designs. For this purpose, either scattered on the loose glitter coated with gel nail or used Glitzergel. 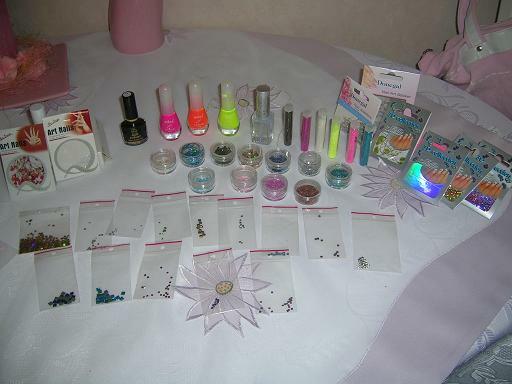 The glitter is available in different grades and in a huge range of colors. The best are probably the Glitter, the change in light color. You can also sparkle with wonderful accents, or produce on the entire nail with a gradient more sparkle. Pigments are a further, very nice way, the nails to make color. They are either mixed in a gel or rub it directly into the Schwitzschicht of the cured gel. If you are discreet as glitter, but we still get great effects. Ceramic flowers and figures made of polymer clay are probably more suitable for more courageous clients. But you get great effects and make the out the special and unique.